Manning, who provided classified information to the whistleblowing website WikiLeaks, including video evidence of a U.S. war crime in Baghdad, now faces the possibility of up to 136 years behind bars. The sentencing phase, which is underway, could take a month before a final penalty is decided. As soon as Manning’s verdict was handed down last week, support for his cause and calls for leniency from Judge Col. Denise Lind in his sentencing poured in from around the world. An open letter from 17 Members of the European Parliament called for President Obama to pardon the young Army private, who spent three years in pre-trial incarceration – much of it in conditions amounting to torture in violation of international law. “As Members of the European Parliament, who were elected to represent our constituents throughout Europe, we are writing to express our concerns about the ongoing persecution of Bradley Manning, the young U.S. soldier who released classified information revealing evidence of human rights abuses and apparent war crimes in Iraq and Afghanistan,” reads the letter. Rather than causing harm, Bradley Manning’s release to WikiLeaks of the Iraq War Logs and the Afghan War Diaries shone much needed light on those occupations, revealing, amongst other abuses, the routine killing of civilians. The bleak picture painted by these war diaries contrasts greatly with the rosy progress reports being provided to the public by military and political leaders. PFC Manning has said he felt that if the American public had access to this information, this could ‘spark a domestic debate’ on American foreign policy ‘as it related to Iraq and Afghanistan’. Far from being a traitor, Bradley Manning had the best interests of his country in mind. The Iraqi people continue to suffer the consequences of this war, even after the withdrawal of foreign troops, with millions of homeless refugees and the resumption of sectarian violence. Meanwhile, eleven and a half years after the U.S invaded Afghanistan, that nation has yet to form a functioning democracy or to free itself from the Taliban and fundamentalist warlords. He also expressed doubts that the U.S. will take into account international human rights in determining Manning’s punishment. “I think that [Manning’s] sentence will not likely take into account the view the international human rights organizations,” Dolgov said. 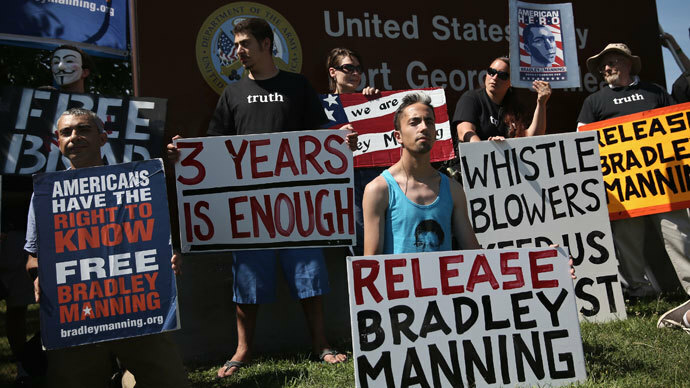 Amnesty International welcomed Manning’s acquittal on the “aiding the enemy” charge, but regretted that the U.S. government continues its persecution of the whistleblower, which it said demonstrates misplaced priorities on national security. Noting that the hundreds of thousands of documents Manning leaked included videos and dossiers that revealed human rights violations and breaches of international humanitarian law by U.S. troops and the CIA, Amnesty said that it undermines accountability when the U.S. government is so selective about who it chooses to investigate and prosecute. “The government’s pursuit of the ‘aiding the enemy’ charge was a serious overreach of the law, not least because there was no credible evidence of Manning’s intent to harm the USA by releasing classified information to Wikileaks,” said Widney Brown, Senior Director of International Law and Policy at Amnesty International. The government’s priorities are upside down. The US government has refused to investigate credible allegations of torture and other crimes under international law despite overwhelming evidence. Yet they decided to prosecute Manning who it seems was trying to do the right thing – reveal credible evidence of unlawful behaviour by the government. You investigate and prosecute those who destroy the credibility of the government by engaging in acts such as torture which are prohibited under the US Constitution and in international law. Any sentence imposed for the other charges must take into account information relating to Manning’s reasonable belief that he was exposing serious violations of human rights and international humanitarian law, Amnesty said. Brown also noted that Manning’s overzealous prosecution – not to mention his gross mistreatment during three years of illegal pre-trial confinement – was most likely intended to provide a warning to other potential whistleblowers who might be considering exposing the rampant criminality and corruption of the U.S. government. “It’s hard not to draw the conclusion that Manning’s trial was about sending a message: the US government will come after you, no holds barred, if you’re thinking of revealing evidence of its unlawful behavior,” Brown said. This of course would qualify Manning as a political prisoner and/or prisoner of conscience under Amnesty International’s own definition of the term, but to this date, for some confounding reason, the human rights group has declined to designate the imprisoned whistleblower as such. It’s obvious that under any number of these criteria, Manning would qualify as a political prisoner, if not a prisoner of conscience. He was motivated by his conscience and out of concern over the evidence of war crimes, corruption and general wrongdoing committed by his government that he was privy to as an Army intelligence analyst in Iraq. Further, the potential sentence he faces of 136 years in prison would clearly be out of proportion to the offenses for which he has been convicted. Icelandic MP Birgitta Jonsdottir, who has been one of WikiLeaks’ most vocal defenders and has nominated Manning for a Nobel Peace Prize, noted the perverted sense of justice being displayed by the United States by prosecuting the whistleblower but not the crimes that he exposed. “I find it very strange that even if you can actually see soldiers shooting and killing a wounded person nobody has been questioned so may be its time to figure how the U.S. legal system works so somebody could be held accountable for that,” she added. Her sister, Sharon Staples, said that the family is now “praying for leniency” as the judge considers Manning’s punishment. Other campaigns in support of the political prisoner include a #ThankManning letter-writing initiative spearheaded by Amnesty4Manning, as well as rallies and vigils being held across the United States and around the world.